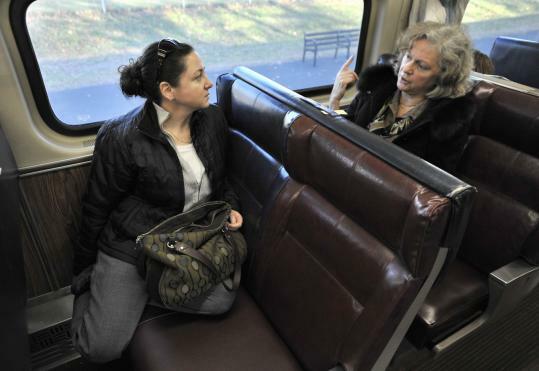 ABOARD THE FITCHBURG LINE — Rebecca Cutting, a daily commuter rail rider, still gets a faraway look when she recalls the time a friend confronted a passenger who was yammering on a cellphone. Soon there will be a haven for all who, like Cutting and her friend, seek less noise with their commute. In January, the T will begin a three-month “quiet car’’ test on the Fitchburg and Franklin commuter rail lines, designating one car on each train as a refuge from chirping ringtones and grating chatter. Passengers on the quiet car will be asked to behave as if they were in a library: to refrain from using phones, silence electronic devices, and keep conversations brief and hushed. “I predict it will be crowded,’’ said Cutting, a Sudbury resident and lawyer for the state Department of Environmental Protection. If the test is successful, as MBTA General Manager Richard A. Davey expects, all commuter rail lines could boast quiet cars during peak hours by the spring. The MBTA would join a number of transit agencies around the country that have introduced quiet cars since the concept began informally on a single Amtrak train a decade ago. Quiet cars are now in place on many Amtrak trains, including most that run along the Boston-to-Washington corridor. Philadelphia’s SEPTA tested a “QuietRide’’ car on one line in early 2009 and soon expanded it systemwide. In an initial survey, 93 percent of SEPTA customers said the QuietRide cars met or exceeded expectations, and 90 percent said most or all of their fellow passengers voluntarily complied with the rules. In September, NJ Transit launched a “Quiet Commute’’ pilot program, which the New Jersey agency plans to significantly expand starting Jan. 3. Chicago’s Metra will also start testing quiet cars next month. Among the nation’s six largest commuter rail systems, that leaves only New York’s Long Island Rail Road and Metro-North Railroad out of the quiet-car ranks. Metro-North could have been the first. In March 1999, officials for the railroad that serves New York City’s northern suburbs said they were thinking about barring cellphones from all but one car on each train, creating a noise car not unlike the old smoking cars. At the time, there were about 70 million cellphones in the United States — less than one-fourth the current total — and some of those were still mounted on car dashboards. With the nation beginning to confront matters of cellphone etiquette, Metro-North’s proposal generated a flurry of media attention and considerable praise. But it also brought free-speech pushback and ridicule — “Maybe we should have separate railroad cars for people with head colds’’ or cheap aftershave, one New York telecom lawyer quipped — and Metro-North swiftly dropped the idea. Instead, the quiet car phenomenon started smaller, with an up-from-the-seats request a few months later. A group of daily riders on Amtrak’s 6:05 a.m. run from Philadelphia to Washington persuaded the crew to designate one car for those wishing to sleep or work in peace. Its success prompted Amtrak to officially brand the “Quiet Car’’ in 2001 and then to expand it to other intercity trains. Public radio’s “This American Life’’ expounded on the Quiet Car, and author and humorist Christopher Buckley, who does much of his writing on the rails between Washington and New York, wrote a “Nazi of the Quiet Car’’ essay about his role as a tactful but persistent one-man enforcer — which included hushing FBI Director Louis Freeh when he was bantering about golf with a group of G-men, despite the Quiet Car signs overhead. On a recent morning Amtrak Acela Express bound for New York from South Station, a conductor made occasional Quiet Car announcements to remind passengers of the rules, supplementing the six signs hanging above the aisle. Passengers worked, read, listened to headphones, and dozed. The only sound over the steady rumble of the train was the occasional crinkling of a potato chip bag and the click-clack-click of laptop keys. Twenty minutes in, an iPhone rang with the jangle of an old-fashioned telephone; a red-faced young man in a cardigan muffled the ring and ducked into the next car before answering. Approaching Stamford, Conn., the woman next to him inadvertently hit the speaker on her cellphone, broadcasting a voicemail message from a man with a French accent. But there was one repeat scofflaw: A man in gabardines and a striped dress shirt who made a series of business calls while working on his laptop, his right leg tapping all the while. As the train rolled through a Rhode Island swamp, a passing conductor caught him. “Excuse me,’’ the conductor said, fixing his eyes on the man and pointing at the nearest Quiet Car sign. The conductor continued to point silently at the sign until the man stammered into the receiver — “I gotta get off the phone, I gotta get off the phone’’ — and hung up. “We’re trying to make it as friendly as possible, but you do run the risk of having QuietRide vigilantes,’’ said Kim Scott Heinle, SEPTA’s assistant general manager for customer service. Wherever there is a quiet car, there are some riders eager to enforce the rules at the first sign of an infraction. Dosier Hammond, who sometimes sits in NJ Transit’s Quiet Commute cars, recalled being immediately scolded the one time he took out his phone. He was on a delayed train, and he was calling his doctor to say he might be late for his appointment. While tactful peer pressure can help preserve quiet, SEPTA frowns on those who accost noisy first-timers unfamiliar with the rules, or who file written complaints about crying babies. “You have to understand, it’s not always going to be 100 percent,’’ Heinle said.